Finding it hard to go with the flow? Is emotional vulnerability hard for you? Do you want to go in a new direction but feel stuck? 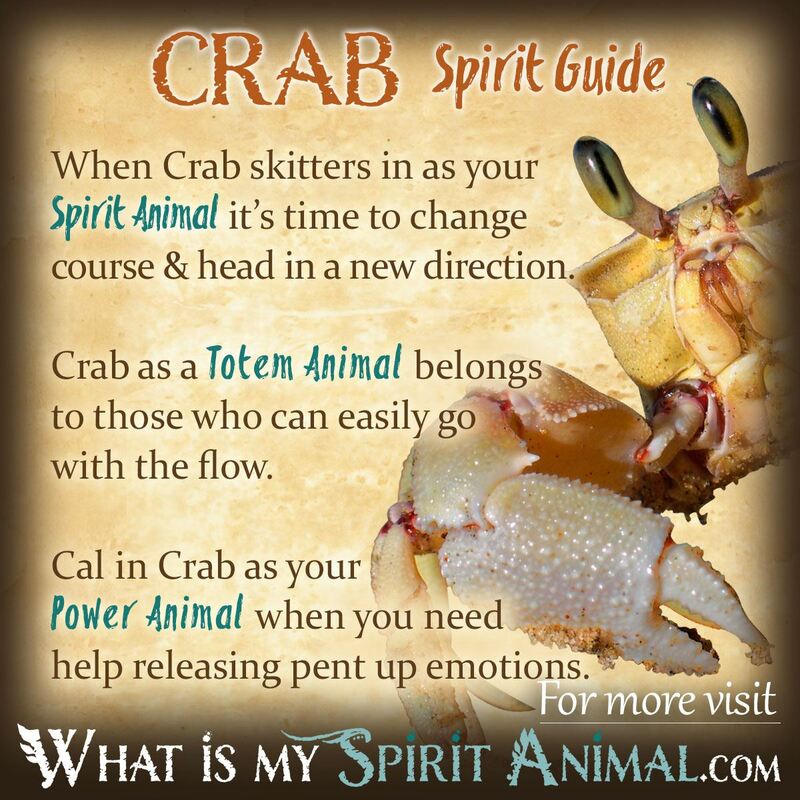 Crab as a Spirit, Totem, and Power Animal can help! Crab teaches how to hold on tight when you’re feeling insecure and to sidestep obstacles with grace. Delve deeply in Crab symbolism and meaning to find out how this animal spirit guide can educate, assist, and animate you. If you discover that Crab images keep skittering into your life, you may have discovered an animal spirit guide or totem that wants your immediate attention. As a general rule Crab represents the moon. It’s aligned with Yin energies and the ebb and tide of Mother Ocean. From a purely observational standpoint it’s hard to overlook the Crab’s symbolic value of having a “hard shell”. This means that Crab energy protects people from vulnerable discoveries and personal weaknesses when they are not ready to open up. The shell of the Crab is also its home, and as such it has become an emblem of happy domesticity. Another natural aptitude is the sideways movement of the Crab, which is not common to land dwellers. With that in mind, Crab could portend your need to “side step” a situation for something safer. There’s no need to be so direct here. Situations call for something a little unorthodox. Crab claws are very strong. If this creature grabs onto something you’ll be hard pressed to get the claws open. Here, the symbolic value of Crab is resiliency and unwillingness to give up, particularly those things we feel we have earned rightfully. Crabs shed their shells when they grow, providing the additional meaning of renewal and rebirth. The only caution here is that Crabs become very defenseless during the process of change. Until that new environment manifests proceed with caution. The Chinese regard Crab as a harbinger of good luck. It’s also an acclaimed aphrodisiac for men suffering from poor virility. Throughout China the Crab with its arms fully extended equates to a sun in splendor. Carved or painted in this form, Crab becomes the brilliant sun, chasing away any shadows in our lives. It is an excellent talisman for protection. Crabs show up in seafaring myths of the world’s creation often as bearers of earth that would become land, having gathered it from the bottom of the ocean. This means that sometimes we have to swim deep into our inner world to discover our creative material or magickal muse. Don’t be afraid! Crab knows how to navigate the waters easily and you’ll begin seeing results in no time. If you’ve been asking the question of, “what’s my spirit animal” and Crabs keep showing up in your life, you may have found your answer. As a spirit guide Crab comes to you bearing one message: change your path. Whatever your seeking can’t be obtained directly, so you have to try a new tact. In order to find the right approach, Crab counsels you to take time away from all the noise and unsolicited advice and get into your shell for some serious meditation. Listen to your heart. Another message from this animal spirit guide is one of floating outward toward something new and fresh. Consider: what is it that has always captured your mental or spiritual curiosity? Check out that horizon and see how it impacts your soul’s growth. For such a tiny creature, the Crab Spirit Animal hits on the soft underbelly of whatever holds you back. This can be uncomfortable because Crab medicine and energy requires that you face fears and start to shine the light in dark places. Procrastinators, those with poor self–images, people unwilling to change and those who feel undervalued may find Crab’s claw snapping at your heels to start working on those fears and behaviors. They’re doing you no good, and you can’t hide them in your shell forever. Those with a Crab Totem Animal are (usually) proverbial wall flowers whose innate sensitivity often leads to isolation. From this place of safety you become free to explore challenges and relationships on your own terms, one at a time, determining which can be trusted. If Crab opens its shell to a small circle, but they are people that “fit” the entire demographic of your life and goals. Consider looking to a Crab animal totem when all your other options for reaching a goal are exhausted. She will show you how to Crab dance your way to another approach that you never considered. Throughout that process the Crab spirit guides you safely into the next great horizon. Also, carry a Crab totem when you feel over-exposed be it mentally, physically or psychically. The Crab totem strengthens your auric field, only allowing welcome energy through that shell. When Crab people are backed into a corner they are ferocious warriors. Not all will come out and fight but those who do show that they have the heart of a lion. Call on Crab as a Power Animal when you need to “go with the flow”. This water creature rides the waves with ease, but also knows how to navigate on land in a truly unique way. That means Crab as your Power Animal also helps you stay true to yourself and supports individuality. Crab medicine sometimes appears in our life when we’re under stress and our emotions get all bottled up. It really is OK to feel Crabby sometimes, so long as you don’t cling so long that it becomes bitterness. Invoke the psychic powers of Crab if you’re afraid of newly developed spiritual gifts. In this situation, Crab ties to lunar influences and the water element. You may find that recently manifested psychic abilities feel daunting, but you can learn to protect yourself and take control over your abilities through practice. A little patience goes a long way here. In some Native American traditions the Crab symbolizes rebirth because they thought humans reincarnated as Crabs and other sea creatures. As in other settings, the Native Americans viewed the Crab spirit as tied to the moon, our emotions, intuition and the waves of life. Shamans feel that Crab appearing in your life represents a call to examine your feelings to see what’s caught in seaweed and what’s running away with the high tide. In tribes that lived near the ocean Crab had the additional meaning of sustenance and admiration. In some of these communities it is still common for young men to gift the tribal elders with fresh Crab as a sign of respect. Dreaming of Crabs often indicate that you’re either over-exposed or overly-protected to the point of dependence. They may also represent a person’s fear of feeling too much, too intensely. Learn more about Crab Spirit by reading Meaning of Crab in Dreams on WhatIsMySpiritAnimal.com! In the Western Astrology & Zodiac method, Crab is the constellation for the Zodiac Sign of Cancer. Even if your Zodiac Sign is not Cancer, it can help you to better understand the personality traits and characteristics of this animal spirit guide. Visit our sister-site BuildingBeautifulSouls.com to learn all about the Cancer Zodiac Sign.